We have found a connection to one of the most famous German Christmas songs and our building. Johannes Daniel Falk, father of Gabrielle Saeltzer (wife of our architect,) writer, poet (friend of Schiller and Goethe) and founder of the youth social work movement has been credited along with Johann Gottfried Herder for this song. As the story goes a Sicilian orphan boy started to sing this folk song at Christmas night at the Falks’ home. The Falk family have opened their house as shelter to orphaned children after the devastating Napoleonic wars. Our architect, Alexander Saeltzer was born 200 years ago on July 31, 1814 in Eisenach, in the Grand Duchy of Saxon-Weimar Eisenach during the time of Grand Duke Karl August. 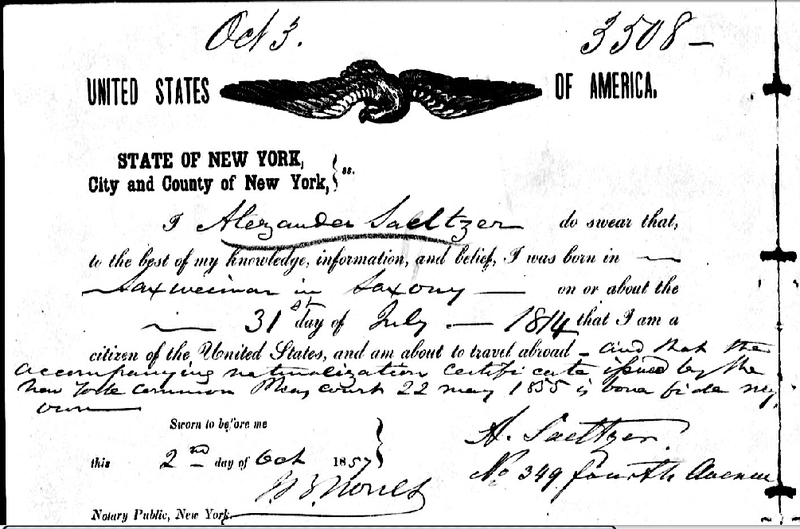 His US passport application i(above) has been submitted in 1857 with the accompanying document of his naturalization certificate that dates back to 1855. In the coming weeks we will share with you details about his public and private life, his commissions in New York, Long Island, Canada and California and design for those that he have not won, his research about the connection between ventilation and sound and the architectural style best suited for tall buildings. In 1864 the Hebrew Free School Association came into existence, as the story goes, to counter the initiatives of Christian missionaries who opened a school on New York’s East Side that offered to teach Hebrew to Jewish children with the agenda to convert them to Christianity. 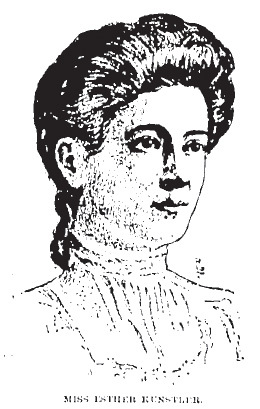 Throughout various states of the Union a movement gradually spread for the organization of free religious schools, which would bring into a common-school system children from the various congregations in each city. 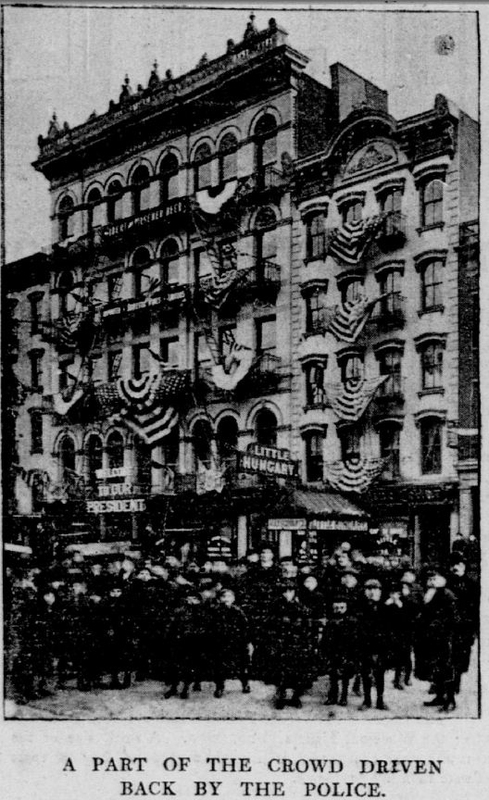 This was no surprise to Anshi Chesed on Norfolk Street; the headquarter of the missionary activity was just across of their building, at the Episcopal Mission Church of the Epiphany (later called Pro-Cathedral) on Stanton Street, between Norfolk and Essex Streets, at the location of the present PS 20 Anne Silver School and the ABC Playground. 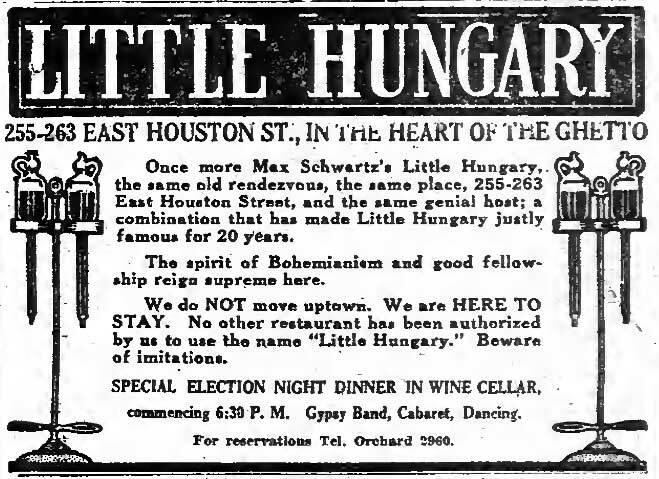 A few months before the Hebrew Free School association came into existence, this notice was circulated to all New York congregations, including Anshi Chesed. 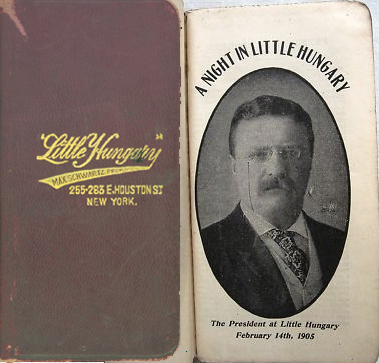 The Jewish Congregations of New York will shortly establish Hebrew Free Schools, where Jewish youth may be educated in the Hebrew language, as well as in their religion. Due notice will be given of the location of these projected schools. Parents are accordingly earnestly cautioned against entrusting their children to any “free schools” purporting to be for the instruction of young Israelites, except those to be organized under the supervision of the Congregations, and which, it is expected, will be open at an early day. By a resolution, adopted at the meeting of the officers of New York Congregations, held on Sunday last, you are requested to have the above notice read in Synagogue, in English or German, for four successive Sabbaths and during the coming Holydays. 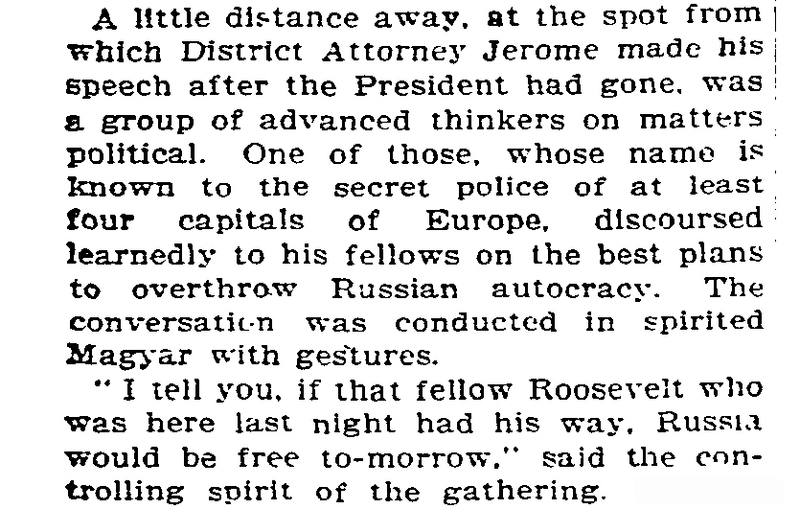 New York, April 6, 5624. The mixed format of the date gave us a little headache but we concluded that April 6, 5624 was 29 Adar II 5624 / April 6, 1864. Part of the grassland covering the island of Manhattan during the Lenape era, our land on today’s Norfolk Street lay a short but safe distance from the salt meadows of the East Side. The street, in its earliest incarnation, was a small dirt road cutting into the bucolic land of Pieter Stuyvesant, Director General of the Dutch West India Company, just off Mr. Jones’ property. Like neighboring Essex and Suffolk Street, it was named after English counties in the early days of English settlement. We made a bold attempt to locate Norfolk Street and mark the present location of our building on early maps. 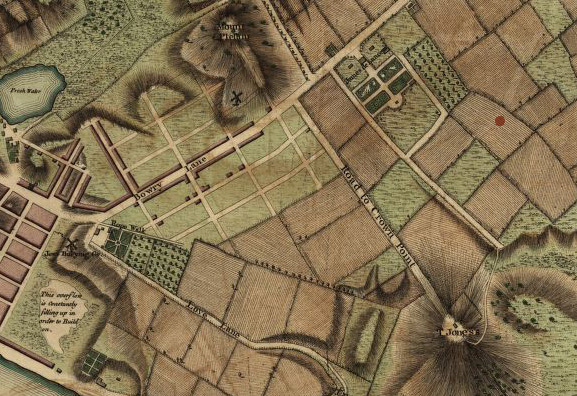 In the 1770s, it neatly fit into the island’s first planned street layout, the DeLancey Farm’s grid forming one of the main roads with access to the North from waterways. James DeLancey developed ‘East-West’ accessibility with new thoroughfares below the spacious core of his estate, the DeLancey Square, modeled after London’s great Georgian residential enclaves. 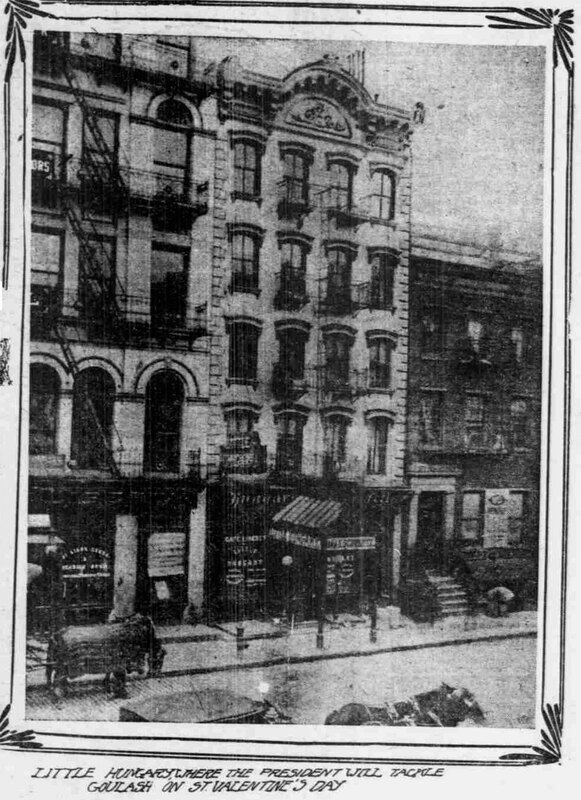 The street that today runs just South of our building was named after his estate foreman George Stanton, a diligent worker, even after General Washington’s American War of Independence forced the Loyalist DeLancey to desert his entire (legal and natural) family and abandon all his property in the colonies. As part of major events in the year of 1805 Cradle Days of New York (1609-1825) lists the paving of Norfolk Street. 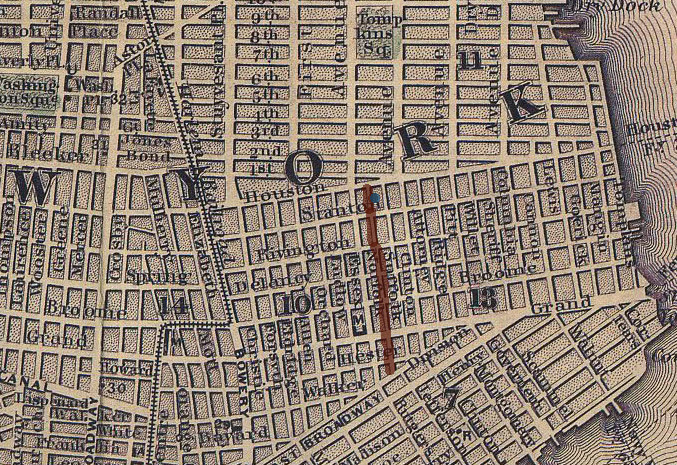 Maps show Norfolk Street connecting Division Street–the oirginal dividing line between the Rutgers Farm and the DeLancey Farm in the colonial era–with North Street, a strategic thoroughfare that constituted the geographic border of municipal development on New York’s East Side up until the early 19th century. Starting with City Council documents from 1808, North Street becomes Houston Street; the name’s origin and pronunciation is a hot topic to this day. 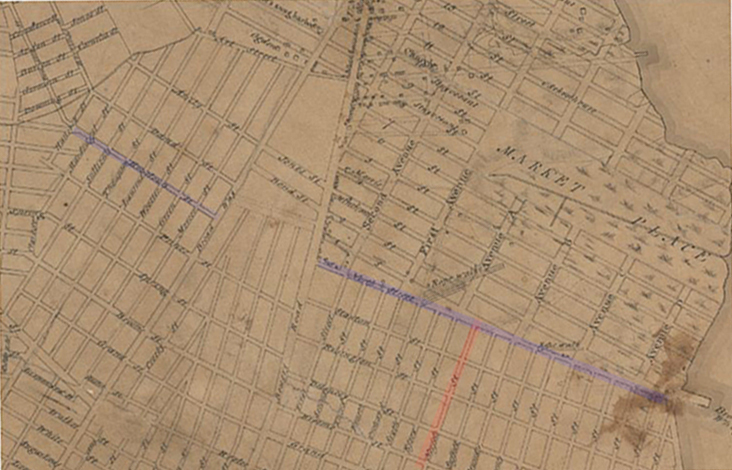 It involved the donation of a cut-through tract of land on the West side of the island (between Bowery Lane and Broadway) that enabled the city to connect a street named Houston to the prominent North street (see map below.) 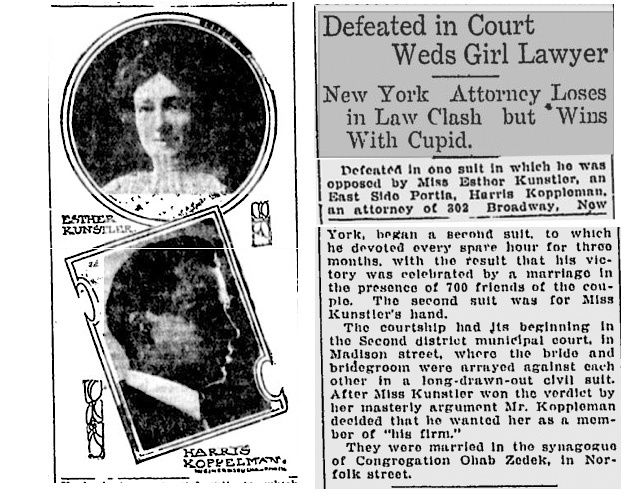 It is reasonable to believe that the street’s nomenclature originates as a grand gesture from the wealthy landowner Nicholas Bayard III, towards his daughter, Mary. She had married a certain William Houstoun [no typo], a delegate to the Continental Congress from 1784 through 1786 and to the United States Constitutional Convention in 1787. 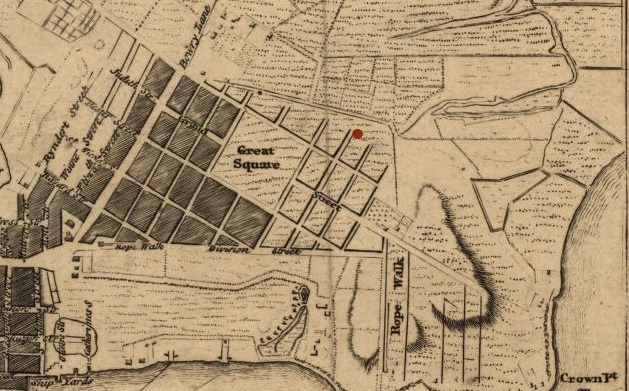 The 1811 Commissioners’ Plan established the foundations of the city grid as we know it, anchored it around the little pedestrian island we now call Peretz Square, just off today’s First Avenue and First Street. 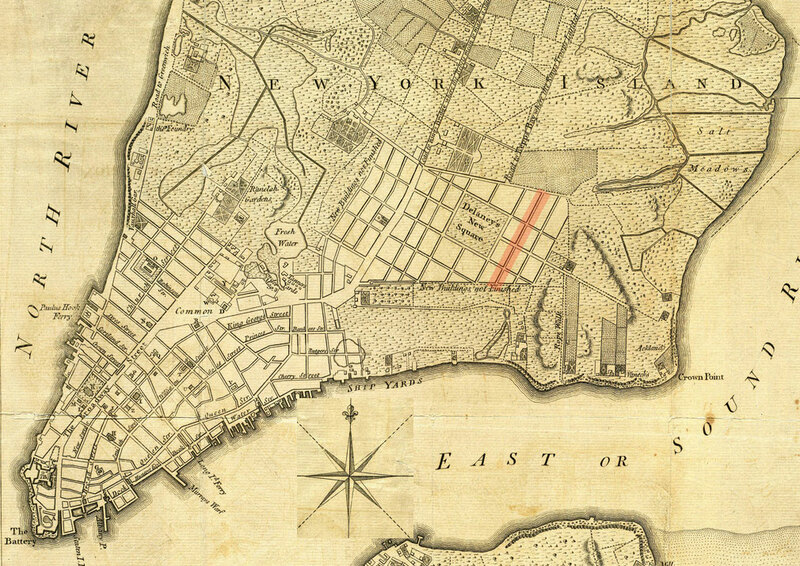 The names of the streets below Houston street and East of Essex street, an already established grid, got incorporated with no change into the master plan of the growing city. 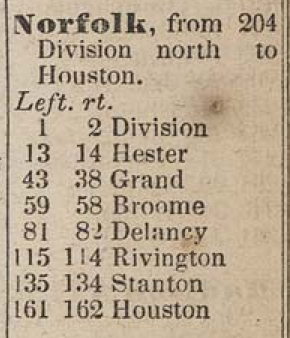 When a piece of land was purchased by congregation Anshi Chesed in 1849 to build a new synagogue on Norfolk Street, the empty lot was assigned 142-146; the numbering ended with 162 at Houston Street. We are ready for Happy blogging!